The most powerful solid rocket booster ever built was fired up for the first time Wednesday in a test that NASA described as a "significant milestone" toward Mars. Tied horizontally to the ground at the base of a Utah mountain, the 177-foot-long (54-meter) Space Launch System (SLS) booster was hot-fired for two minutes to see how the system would perform when eventually launched. "Great test, just a fantastic result," said Alex Priskos, who manages the Boosters Office for the SLS program at NASA's Marshall Space Flight Center in Huntsville, Alabama. The rocket's first test flight is scheduled for 2017, when it will be configured to lift 70 tons of gear into space on an unmanned Orion spaceship. Eventually the SLS "will provide an unprecedented lift capability of 130 metric tons (143 tons) to enable missions even farther into our solar system," the US space agency said on its website. The technology represents a big boost over the power needed to send astronauts to space during the three-decade-long shuttle era, which ended in 2011 when the program was retired. "These motors have 25 percent more energy than the motors we used to get the shuttle off the ground during the space shuttle days," said Todd May, program manager for SLS. 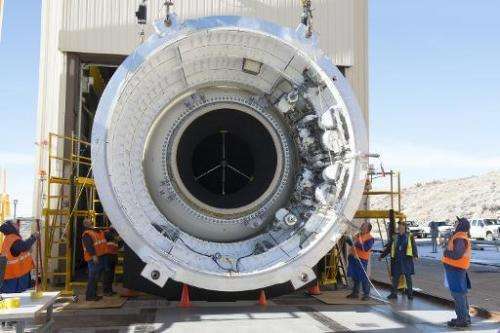 Wednesday's booster test, which heated the equipment to 90 degrees Fahrenheit (32 Celsius), took place at ATK Aerospace System's test facility in Promontory, Utah.